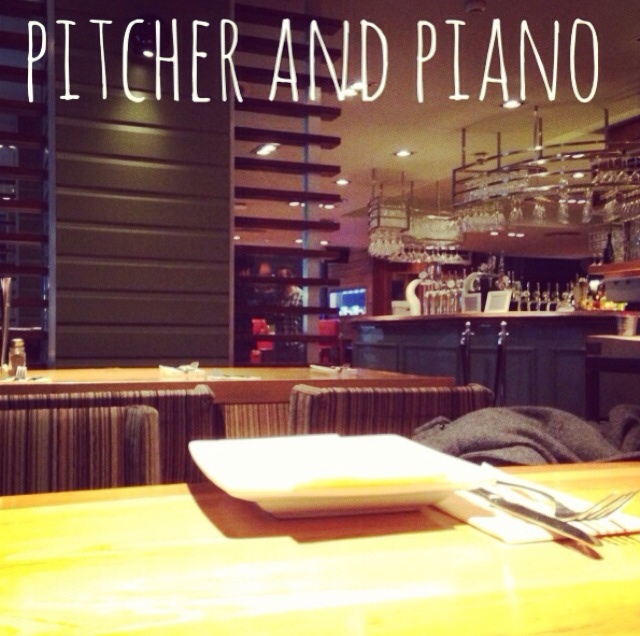 The location for Pitcher and Piano in Southampton is perfect; located at Ocean Village you're pretty much surrounded by boats, and when the weather is nice you'll able to sit outside and enjoy the beautiful view. I've eaten at the restaurant before, including on date nights (after going to Harbour Lights), with my parents after I graduated and a housemate dinner in my third year. It's great for any occasion - if you want a meal, cocktails or fancy a beer after work. On Sunday night, it was really quiet but we were greeted by a very smiley waitress. She was lovely from the start and we were able to have a little joke with her about the amount of food my boyfriend eats. 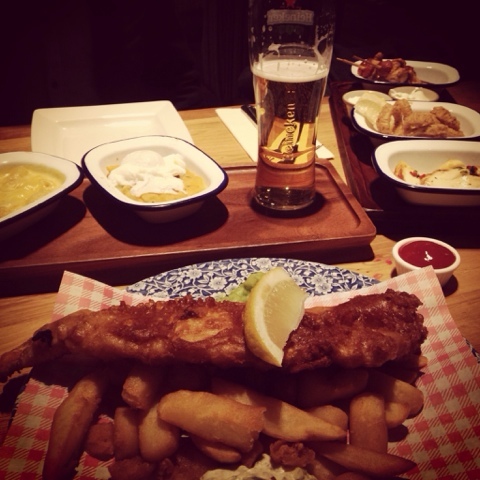 As usual I went for Battered Fish and Fat Chips - it seems somewhat appropriate when you're next to the sea. My boyfriend had 3 grazers inc. Salt and Pepper Calamari, Chicken and Chorizo Skewers and Pan-Fried Halloumi. But no, that wasn't all! He added Chorizo Hash and Mac 'N' Cheese to his meal. The waitress was speechless that he asked for so much, and thought he couldn't eat it all, so he set out to prove her wrong. The fish was the best I've had from Pitcher and Piano, usually their fish has a lot of bones but I didn't have any that night! Sam enjoyed all of his tiny meals too (haha) but was very full as you can imagine. We both had a little bit of room for dessert - I had three scoops of ice cream (chocolate, strawberry and vanilla) whilst Sam had Apple Crumble. We were too optimistic and couldn't finish our desserts though. Next time, if I'm less full I'll have to try the Sticky Toffee Pudding. There's a massive variety on the menu - from burgers, hotdogs, bangers and mash, salads to a fish finger buttie. I'm sure there is something to suit everyone! The food is great, the waiters are polite and you have an amazing view. I'd definitely recommend! Oh wow I haven't been before but there was one in Brighton on the seafront next to my flat wish I'd gone! I'm from Portsmouth originally though so it should be easy enough to pop down and see! Glad you had a nice time!